A polished double-T logo medallion tops the rounded toe of a sophisticated ballet flat cut from supple leather and designed with a slip-resistant rubber sole, layered foam cushioning and stitch-and-turn construction for refined seamwork. The split sole and flexible construction make it easy to fold into the included shoe bag and take along, whether you're traveling, commuting or heading to a gala event and planning to dance the night away. 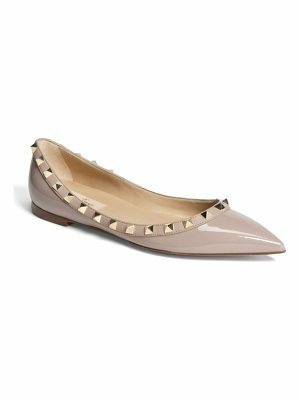 Style Name: Tory Burch 'Minnie' Travel Ballet Flat (Women). Style Number: 1064962. Available in stores.